Olive Martindale was born on 7 May 1778 at Westfield, Hampden Co., MA.1 She married Harvey Hungerford on 9 August 1801 at Westfield, Hampden Co., MA. Mary, age 12, was enumerated in the 1860 Greenwood Twp., Crawford Co. PA, federal census, page 49 (stamped page 337), in the household of her parents. John was a farmer, age 35; Julina was 30. Oliver was 10, Sarah was 6, and twins Elma and Elda were 4. Julina C. Dillery married John H. Caldwell. Fred and Anna were enumerated in the 1900 Townville Borough, Crawford Co., PA, federal census ED 42, page 13B, the very last family enumerated. 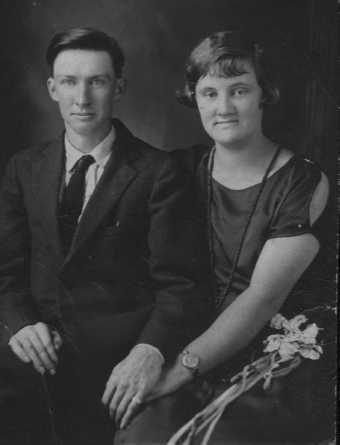 He was a blacksmith, age 30, born in PA; she was 30, born in PA. Children in the household were Clarence C., a son born May 1893, and another son, born Dec 1898; all born in Pa.
Fred and Anna were enumerated in the 1920 Spartensburg Borough, Crawford Co., PA, federal census, ED 39, page 4A. He was a stock dealer, age 50, she was 49. Children in the household were Clarence C. age 29, and Maxwell, age 21. Living next door was Donald D. Case. Florence Lattin was born in 1886 at OH. She was the daughter of Eugene M. Lattin and Emma Phoebe Case.1 Florence Lattin married Isaac Watson. Florence Lattin died in 1945. Donald and Hazel were enumerated in the 1920 Spartensburg Borough, Crawford Co., PA, federal census, ED 39 page 4A. He was a stock dealer, age 26, she was 27. The only child in the household was Fred B., age 3 6/12. Donald and Hazel were enumerated in the 1930 Edinboro, Erie Co., PA, federal census, ED 12. He was a butcher in a meat market, age 46, she was a packer in a stationary, age 37. children in the household were Fred 14, and Beatrice 10. [S182] Social Security Death Index (on-line), Ancestry.com, SSDI, Ancestry.com, SSAN 210-18-1513. [S182] Social Security Death Index (on-line), Ancestry.com, SSDI, Ancestry.com, SSAN 178-14-5782. Hazel Dell Baker was born on 12 June 1892 at Townville, Crawford Co., PA.1 She was the daughter of Fred Baker and Getty Shorts. Hazel Dell Baker married Donald David Case, son of Fred Lewellyn Case and Anna Estelle Lamb, on 12 July 1912 at PA.1 Hazel Dell Baker died on 10 September 1967 at St. Vincent's Hospital, Erie, Erie Co., PA, at age 75. Obituary ( Monday ) Sept 11, 1967, Erie Daily Times, Erie, PA.
Mrs Hazel Dell Case, 75 of 214 Erie St, Edinboro died Sunday at St. Vincent's Hospital following a brief illness..
She is survived by her husband, one son Fred B Case of Lockport, NY, one daughter Major Beatrice Case, Fort Carson, Colorado Springs, Colorado, one brother Donald Baker of Youngstown, Ohio, three grandchildren and one great grandchild...Two sons Donald and Leon Case, one brother Donald Baker and one sister Mrs Lulu Harris preceded her in death. Friends may call at the Glunt Funeral Home, 210 Erie St, Edinboro on Monday from 7 to 9 p.m. and Tuesday 2 to 4 and 7 to 9 p.m. and invited to attend services on Wednesday at 2 pm with the Rev George W Das of the First United Presbyterian Church of Edinboro officiating....Burial will be in Townville Cemetery ( Kingsley Cemetery ), Townville, PA.
Fred Baker Case was born on 18 June 1916 at Townville, Crawford Co., PA.1 He was the son of Donald David Case and Hazel Dell Baker.1 Fred Baker Case married Mary Elizabeth Mayes circa 1940. Fred Baker Case died on 17 November 1970 at Lockport, Niagara Co., NY, at age 54. Wilson Rufus Wheeler was born on 12 July 1856.1 He was the son of Samuel Wheeler and Elizabeth Holcombe.1 Wilson Rufus Wheeler died on 27 May 1878 at age 21. Walter came to Butler County, Kansas, in 1873 and taught in the common schools for a number of years. He also served two terms as Supt. of Public Instruction in Morton County, Kansas. [S398] Edyth Beula Holcomb Sargent, e-mail. Edyth Ellen Eliza Watson was born on 26 January 1902 at El Reno, Canadian Co., OK.1 She was the daughter of John Henry Watson and Susan Lucretia Gorgas.2 Edyth Ellen Eliza Watson married Daniel Rufus Holcombe, son of Daniel Rufus Holcombe and Ruhama Louisa Lamb, on 2 October 1924.1,2 Edyth Ellen Eliza Watson died at Tacoma, Pierce Co., WA. Harley Daniel Holcombe was born on 1 January 1926 at El Reno, Canadian Co., OK.1,2 He was the son of Daniel Rufus Holcombe and Edyth Ellen Eliza Watson.1 Harley Daniel Holcombe married Louise Land Barber, daughter of Ivy Monford Barber and Beulah Land, on 3 July 1945 at Tampa, Hillsborough Co., FL.1,3 Harley Daniel Holcombe died on 5 November 1993 at Oklahoma City, Oklahoma Co., OK, at age 67.1,2 He was buried at El Reno Cemetery, El Reno, Canadian Co., OK.
[S182] Social Security Death Index (on-line), Ancestry.com, SSDI, Ancestry.com, SSAN 505-26-5283. Louise Land Barber was born on 2 November 1923 at Cross City, Dixie Co., FL.1 She was the daughter of Ivy Monford Barber and Beulah Land.2 Louise Land Barber married Harley Daniel Holcombe, son of Daniel Rufus Holcombe and Edyth Ellen Eliza Watson, on 3 July 1945 at Tampa, Hillsborough Co., FL.1,2 Louise Land Barber died on 22 December 1981 at Oklahoma City, Oklahoma Co., OK, at age 58.1 She was buried at El Reno Cemetery, El Reno, Canadian Co., OK. It is probably this Hannibal who was enumerated in the 1900 Douglass Twp., Butler Co., KS, federal census, ED 8, page 7A. His wife Jennie, was born in Illinois in Mar 1869. 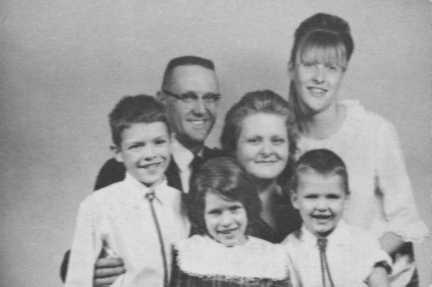 Children in the household were Raymond 7, and a daughter Anita (?) age 6. This Hanibal was enumerated in the 1910 Douglass Twp., Butler Co., KS, federal census, ED 9, page 1B. He was a grocer, age 48, she was 41; they had been married 19 years. Raymond 17, and Anita (?) 16 were also in the household. This Hannibal and Jessie were again enumerated in the 1920 Douglass Twp., Butler Co., KS federal census, ED 17, page 2A. He was a merchant age 58; she was 50. His married daughter was in the household with her husband, Charles Anderson, and their daughter Myriam, age 1 8/12. Raymond, apparently their son, was enumerated on page 3A, age 27, a merchant; wife Nellie was 24, and son Raymond Jr. was also in the household. It is apparently this Charles F. Holcombe was enumerated in the 1900 Pleasant Twp., Butler Co., KS, federal census, ED 18, page 4B. 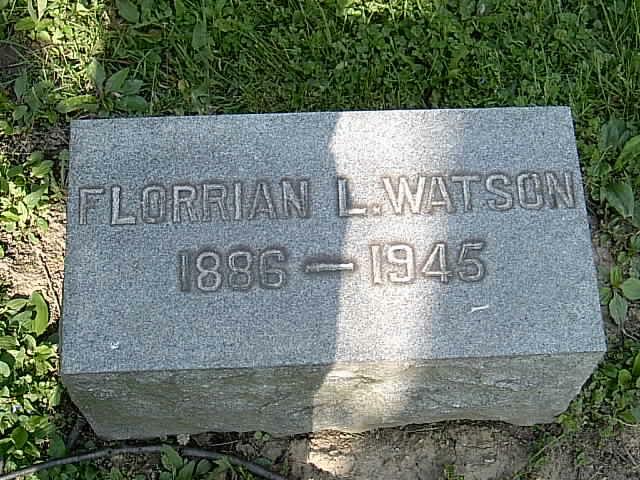 He was a farmer, born Jan 1870 in Indiana; wife Leona was born Nov 1870 in Wisconsin. Children in the household were Claude C., born Jul 1895 in KS, and Viola F., born May 1897 in Ks. This Charles F. Holcombe was again enumerated in the 1910, Pleasant Twp., Butler Co., KS, federal census, ED 20, page 6A. Children in the household were Claude K. 14, Viola F. 12, Noel R. 8, and Avis D. 5. This Charles F. Holcombe was enumerated again in the 1920, Pleasant Twp., Butler Co., KS, federal census, ED 31, page 5A. He was a farmer age 49; his wife Leona, age 49 was born in Wisconsin. Children in the household were a son Noel R. age 18, born in KS, and daughter Dee 15, also born in KS. Col. Horatio Nelson Case was born on 24 July 1806 at Granby, Hartford Co., CT.1 He was the son of Capt. Abner Case and Phebe Smithson.1 Col. Horatio Nelson Case married Amorette Root on 9 October 1850 at Springfield, Hampden Co., MA.1 Col. Horatio Nelson Case died on 24 May 1889 at Springfield, Hampden Co., MA, at age 82. He was buried on 27 May 1889 at Springfield Cemetery, Springfield, Hampden Co., MA. The death yesterday morning of Col Horatio N Case, for over 30 years president of the Pynchon national bank, came almost without warning. He had spent Thursday at his desk in the bank, and never seemed in better spirits. His wife was awakened by a groan yesterday morning, and found her husband dying. Dr. Chapin was summoned, but Col Case died almost instantly from a stroke of apoplexy. Col Case was born at Granby, Ct, July 24, 1806 and was the son of Abner Case, a prosperous country merchant. Col Case inherited his father' shrewd business methods, as well as his fortune. He was associated with his father in business in young manhood and became active in public and business affairs in Connecticut. He was an active democrat and participated in the gatherings of that party. he was elected to the Legislature and served on Gov Cleveland's staff from 1840 to '42, there gaining his title of colonel. He was offered other public positions, but declined them, refusing once to accept a nomination as state controller. Col Case's interest in banks began with his business career in Connecticut, which naturally centered at Hartford, and he was a director in the Exchange bank of that city. He moved to this city in 1850, attracted by the enterprise of the town which had been quickened by the growth of the railways. For a time he did not enter into active business life, but was employed in the care of the family estate and made successful investments. He became identified with the old Western bank and was a director, but withdrew his interest before its failure in 1857. When the Pynchon bank was organized in 1853, he was one of its most earnest promoters, and was elected its first president, an office he held with but four years of interruption until his death. Henry Alexander was the first cashier and Willis Phelps and Roger S Moore were directors. Col Case was also for many years a director in the National bank of Redemption at Boston. He resigned the presidency of the Pynchon bank in 1858, and was succeeded by James Kirkham, but resumed the position again in 1662. Col Case's home life has been a happy one. He married Amoret P Root, daughter of Joel Root of East Granville, October 9, 1850, another daughter of Mr Root being married to Calvin Spencer of Hartford at the same time. The double wedding took place in the Court-street house of Roger S Moore, who had married another daughter of Mr Root. In 1860, Col Case bought a house and lot of Edmund Freeman on Maple street,and had since occupied it. They had one child, a girl, who died in infancy about thirty years ago. The house was made attractive, and in later years Col Case furnished it with valuable paintings. Among them is Wordsworth Thompson's famous painting " The Grand Review at Philadelphia in 1777 " ..He was a lover of flowers, and prided himself on his beds of tulips. He often sent flowers to his neighbors, and was especially thoughtful of the poor in the distribution of such gifts. Col Case came but little in active contact with public affairs. He served on the board of alderman in 1861-2 and did much officially and privately in raising troops for the front. During a term in the Legislature with Willis Phelps he took an active stand against the Hoosac tunnel scheme. Although a life-long democrat, he often acted independently in later life. Personally Col Case was of pleasing address, and his old associates remember him as one of the handsome colonels on Gov Cleveland's staff. He was rigidly punctual and methodical in business and in private life. He was temperate and even abstenious in his habits and carried his regular methods into his rules for sleeping and eating. Although brought up in the strict orthodox faith, he joined the liberal dissenters in early manhood, and identified himself with the church of the Unity. There he was one of the strong men, and of recent years he became attached to Rev John Cuckson, the pastor. Like most men of natural reserve, his chosen friends were few and enjoyed his intimate companionship. Col Case gave for charitable purposes in a unostentatious way. Of the members of his fathers family, a daughter, Mrs Eveline Case, is living near Boston.The funeral will be held from the house, 92 Maple street, Monday afternoon at 3 o'clock, Rev John Cuckson officiating.